I owe much of my journey into Art and Crafts to my wife and work stress. Starting with the stress, I suffered what was close to a nervous breakdown when I became very stressed by my work. Luckily, I decided to give up just before it broke me but believe me when I say I was cracking and needed to stop. The doctors signed me off for three months and told me to go forget work. Not something I took to easily, so I started to get to know the town, the countryside around the town and the people I live amongst. I went from being an anonymous dad to being the dad who took his kids to school and walked the dog everyday. Part of that process required me to fill my time and I remembered painting at school so went looking for an art group and found BAG (Belper Art Group). In a flash I was lost in another world, two hours went and I did not know where. People stopped, talked and helped me make less of a fist of it! So in my wisdom I decreed, “I will try something else when I have mastered Watercolours” little did I know..... More than ten years latter I still have not mastered watercolours. However, I am still in love with trying and that is all that matters. Once I was back at work my wife decided I need other interests and started feeding me odd days and weekends doing “Arty and Crafty” things. Over the years this means I have added “Fused and Slumped Glass”, “Wood Turning” and “Pottery” to the list of things I love to do! Sadly they are not all cheap or compatible; the wood turning in particular is problematic as wood dust can be explosive and any dust in combination with kilns is bad news. Clay is also very messy and produces lots of dust so I will have to edit the list. However, I have not yet decided what will go! I first tried wood turning at school were I produced a table lamp and a checkered bowl which were in the family home for many years. Sadly, the bowl got dropped and broken and somewhere along the way the lamp disappeared. However, they left enough of an impression on me to realise that I love the appearance of wood. 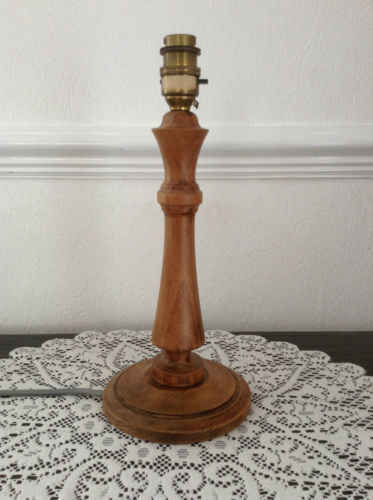 The lamp which was similar to the picture left was made from two pieces of wood one for the upright and one for the base. The two parts were turned separately and held together by simple friction. The finish was the classic beeswax and lots of elbow grease. The bowl was made by gluing together many sheets of wood finished to the same size. The resulting block was then cut again into many sheets and finished. Finally, the sheets were glues together again after being rearranged to form an interesting pattern, simple but effective. Sadly, I failed to grasp working with hand tools and was not allowed to do any more wood-turning! My father-in-law has joined the growing list of people we have lost and part of his legacy was to leave behind a lathe, chisels etc. I have for my sins decided to add to the list of things I want to do, wood turning. To this end I was bought a days wood turning with Gerry Marlow a lovely guy and an excellent wood turner. If you want to try wood turning I highly recommend Gerry he lives up by Sheffield and does demonstrations at clubs around the country. Gerry started by showing me how to make a Dibble. This involved turning a chunk of inch and half square wood into a cylinder and then shaping it into the classic Dibble. Before any finish could be applied to it he showed me how to add a depth gauge by using friction burning to mark the wood, simple but very effective. I don't think it will ever get used as a tool but it will sit on the shelf as a decoration gathering dust! Later in the day I went on to turn a bowl and the pleasure of seeing a compound curved surface appear as if by magic from the end of the chisel was magic. I do enjoy making things and particularly when the process is one of hand crafting, even if a machine is involved. If you are going to do wood turning in any form it is necessary to remove the shavings and dust produced from the work area or wear a breathing mask all the time. I don't like wearing a mask for all sorts of reasons and I don't enjoy cleaning up afterwards. At school I don't think we wore masks and cleaning up was just left to the cleaner and caretaker but that was before health and safety. So you need a large specialist vacuum cleaner and a lot of hoses and you have to get the nozzle in the right place or it does not work or you catch it all the time or both. So in the corner is a very large noisy and complicated arrangement of bit with a small lathe in front of it. On the wall is a rack of chisels and other tools. Alongside is a grindstone to sharpen the chisels and a pile of other small bits and pieces, waxes, oils, sandpaper, etc. Way back at school we played with clay made wound pots and lumps of clay. On the fireplace in my mothers house sat an Owl made from a lump of clay. Not much more than two big eyes and the surrounding feathers but it was definitely an Owl. It's gone now thrown away at some stage in a clear out. On my desk sits a very clumsy cut slab pot with a shiny green glaze and on the front room window ledge is a model house and deg kennel again made with cut slab clay. All are primitive with the exception of the house which is quite effective. Over the years I have played with clay but I have always wanted to have a go at throwing a pot. Tracey said she would like to have a go so I set out to find somewhere where we could try our hand. I finally, came up with ClayWirks a collective based in Wirksworth which is a few miles up the road and suited the purpose to the ground. Seven weeks of two hours a week and we had a handful of pots of varying success. I loved it, the feel of the clay in my fingers as I pulled it up to form a pot. The beautiful shape that forms before your eyes, magic! Then the pot collapses before your eyes, you made the wall too thin or pulled it up too quick or whatever. But for one ethereal moment it was perfect beautiful. As the weeks went on and we got to know the material marginally better the pots became more reliable, more repeatable but still not perfect. Instead of the one of four looking OK, three out of four looked OK. That first pot the one I loved so much at the end of the first night looks like a Saturday night fight. Like all arts and crafts it takes a long time to become proficient let alone good. However, if you stand a chance of getting there the first few steps are normally relatively easy! Art at school was mostly about Poster Paint and coloured paper montages. However, I did learn that I could draw reasonable well and I enjoyed art in general. My only claim to fame was that I painted a large mural, with the help of two or three others, and that we won a prize. It was my painting but I can't paint people or animals, so being a crafty little so'n'so I laid it out, painted most of the buildings, trees, etc and imported others to do the bits I was bad at. I got the credit and I still don't know why! An afternoon was dedicated to art every week and we would draw, paint or collage in luxury of the largest classroom in the school. The stairs were at one end and two cupboards at the other. The two long side walls were glass from ceiling to bench level and a great view was had over the town or up over the playing field and the countryside beyond, it was idyllic. The only bigger space in the town was the school hall and that was not a lot bigger. There were two rooms on the second floor the cooker room and the art room, so it was the double pleasure of art and more girls and in a part of the school that was generally considered to be pretty much off limits! After school art pretty much stopped, I would draw but mostly architectural or engineering type sketches. Houses layouts, car ideas but also other things my mind always had ways of getting off on it's own direction and some of that ended up on paper. Much later I became involved in a club magazine and found I could still draw simple stylised flowers, views and the like. I also discovered I could lay out pages and that I got a lot of enjoyment from both. My return to art came as a result of work stress and need to relax. I found water colours the joy and the hate of the subtleties, the control and the lack thereof! Like everybody that I know that paints I have to be in the mood to paint and occasionally I just can't do it. However, mostly I find I can just sit and paint the biggest problem is what? Some people paint the same thing over and over until they get it right. I can't do that I would simply stop painting. Occasionally I have returned to an inspiration but generally I don't. I'm told I'm not bad at flowers and food, that's not surprising when you consider to paint something you have to look at it very closely and I love both with a Passion. Just sitting here writing this I can smell fresh bread and taste sliced tomato with Extra Virgin Olive Oil but I can also see many flowers; as my wife says you can see them but you can't name them, never could, never will! Sadly, as most of us who paint know the cheap picture frames from the major stores and the throwaway culture has resulted in it being very difficult to sell paintings. The very good can just about cover there costs and the brilliant, if lucky, can make money but for the rest of us getting a contribution to our materials is all we can expect. What do you do when a nice picture frame costs more than the sale price of the framed picture? I now openly admit to painting only because I get a great deal of pleasure from the activity. I know I am getting better; will I ever be good enough? Who knows or cares! As I have said elsewhere I found BAG and returned to Art out of necessity and I shall forever be glad I did. This does not mean it has always been plain sailing. For a long time I found it hard to sit still and do one thing, I guess a symptom of the stress I had suffered. Mow I can generally sit still and relax into whatever I am doing. This is particularly true when I am painting and most Thursday evenings are spent at BAG doing just that. I have now tried most of the basic form Acrylics, Pastas, Water-colours, Oils and a number of the sub-forms and I think water colours are for me. However I have to say I like the ability to over paint in Acrylics and Acrylic Inks. Pastels are I have to say are just uncomfortable for me I just end up with a grey smudge. I don't know if it is because I rest my hands on the paper or I go in with my fingers or what, but! Other produce beautiful pictures with lovely vibrant colours, not me. At this time I am exploring Acrylic Inks and I do find the strong colours interesting. This combined with the ability to freely over-paint is very appealing. The other thing I am playing with at this time is water and the combination of saturated paper and the Acrylic Ink is very interesting if somewhat unpredictable. My first camera was a little boxy Brownie with a blue grey body a fixed lens and I think a fixed shutter. It took rolls of 128 film and took eight or sixteen pictures to a roll. The thrill of collecting the pictures from the chemist and opening the packet to see what had worked and more often what had not was incredible. I would not take a picture because it might not work and cost money. As a result of this training it was a long time before I would just click regardless. Even now I find it hard to throw an image away and I think that results form the cost of those early images. However I was hooked and can still remember many of the pictures including those taken on the last day at school. I've had three Pentax bodies over the years and still own two of them. Four if you count the one my wife bought as a birthday present and returned because I had bought one the same a few days earlier. The K1000 was my love and taught me how to take pictures in a way that no digital camera has ever been able to emulate. The first digital camera I had was and probably still is the best. It only took pictures at 1.8MBit but it produced pictures with great colour, tolerated all sorts of lighting conditions and was fast enough. Only now with phone cameras do I find the same simple picture quality and flexibility. It's not that I want to be able to take snaps, it's that I want to take pictures up close but without the fuss! Even my fantastic Cannon does not give me the shot I want without the fuss and don't get me wrong it takes brilliant pictures, it's just a faff! I guess I work in two ways: one when I just want the picture and want it to be right and one where I want the best possible picture with everything perfect. The former may just be a snap but it probably isn't I'm just being artistic, playful. That means the picture will get looked at with a critical eye and probably discarded because it is not perfect!